Cauliflower seeds can be sown from early spring to early summer to give a crop of tasty nutritious cauliflowers to harvest from summer into autumn. Choose a traditional cauliflower variety with white curds, or go for something totally different and decorative such as a pale green Romanesco cauliflower. Cauliflower is flavoursome and full of vitamins, it is delicious with cheese sauce or try it mashed. The taste is surprisingly buttery and makes a great substitute for mashed potato if you’re cutting down on carbs. A good cauliflower to try is Cauliflower Clapton, it produces excellent flavoured quality, uniform, large, solid and deep white heads and is Clubroot Resistant. To prepare the ground for cauliflowers, dig well in autumn and add Westland Garden Lime if soil is acidic. Then leave the ground over winter as they requires firm soil. Sowing times vary depending on the variety, so it’s always a good idea to check the seed packet. 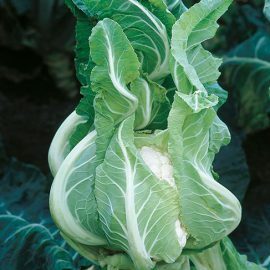 Cauliflowers should be planted out at about 5-7 weeks after germination. 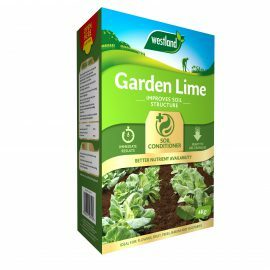 A few daysbefore planting out, add a good quality fertiliser to the ground, such as Growmore Fertiliser or Organic Chicken Manure Pellets. When planting out, use your foot to press the ground around the roots firmly to ensure the seedlings are well anchored. Water well to reduce the risk of stress.